Maybe by now you are figuring out that I love museum websites...especially those that offer quality educational content. So naturally, I was really excited when I found that the Metropolitan Museum of Art has a section on their site exclusively for interactives. And not just one or two, but eighteen! 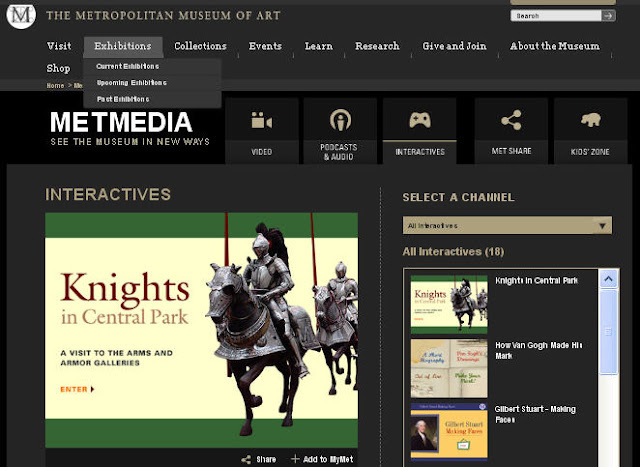 From Knights in Central Park to Cézanne's Astonishing Apples to How Van Gogh Made His Mark, you'll find some informative and interactive programs that allow you and your students to learn online - and have fun doing so. Their site also offers videos, podcasts and a Kid Zone where children can print up their own map and guides of the museum. There is also an educator's section with lesson plans and other publications. Happy New Year to you, as well! And thank you for all your help with MommyMaestra.